What has four legs, a long neck, and a hump? If you guessed a camel than you are correct. Camels are instantly recognizable for their unique shape and iconic hump. They are truly amazing animals with features that allow them to survive and thrive in harsh, barren deserts. Camels are best known for their legendary ability to survive a long time without needing to drink water. Camels routinely go several days or more without drinking any water. Even more surprising is that they can go for several months without any food! How do they do that? Many people mistakenly think camels store water in their humps. Rather, fat is stored in their humps and provides energy when they go without food. Camels do not have a large empty space in their body to store extra water like some internal water battle. Instead their body (specifically their cardiovascular system, kidneys, and other organs) is extremely efficient at retaining and managing water. God gave camels special tools to enable them to go without water for many days. This ability makes camels very important animals for people who live in desert places. Camels are mentioned numerous times throughout the Old Testament as a means of transportation. Jesus would have been very familiar with camels. He may have even ridden one. Camels are still an important means of transportation in Israel and the Middle East today. They carry heavy burdens for their owners. But if you have ever seen a picture of a camel, then you may remember they have very long legs! 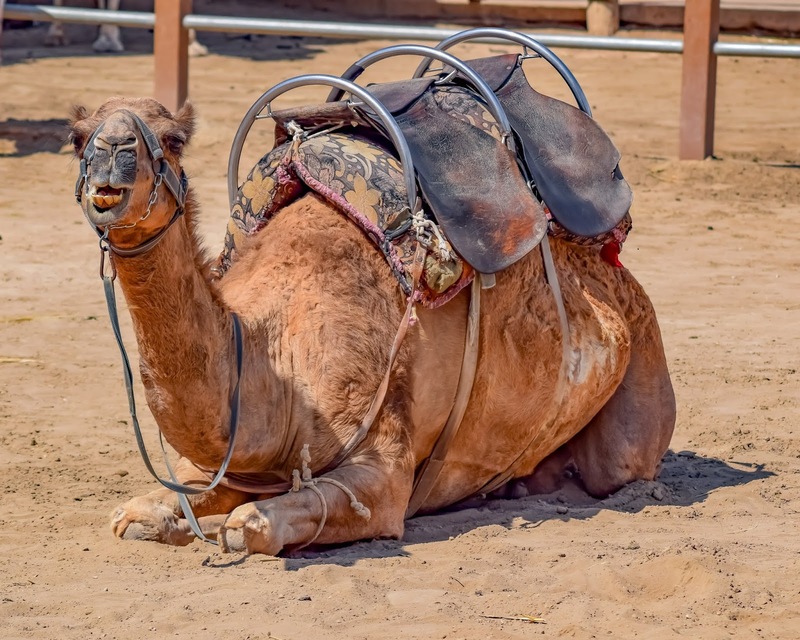 Most camels are 5-7 feet (1.6-2 meters) high and are taller than many horses.1 So how does an owner put a camels burden on and take it off each day? In the morning, the camel must kneel down so that its owner can load the days burden onto its back. A good owner knows just how much the camel can carry for the days journey. After being loaded the camel gets up again to carry his burden for the day. The camel then simply follows his owner who has the greater burden of leading the way safely through the desert. At the end of the day, the camel kneels down again so his owner can remove the burden and the camel can rest. This is exactly how it is when we follow Jesus. When Jesus is our owner he promises to bear our burdens (Psalm 68:19). In turn he asks us to bear his burdens. He will take responsibility for leading us through the desert of life. He says in the key text that when we take his burden that he will place them on us gently. He also promises to give us rest from our burdens, all we must do is simple kneel each night and let him remove them. Have you ever seen a camel in real life? If so what did you think about it? How do we kneel down and let Jesus remove our burdens? What did Jesus mean in the key text (Matthew 11:29) when he said take my yoke upon you? Do you think it is easier to bear the burden Jesus gives us? 1: “Camel,” San Diego Zoo Animals & Plants online, accessed October 7, 2018. https://animals.sandiegozoo.org/animals/camel.